Looking for a “historical beach read” this summer? Look no further. 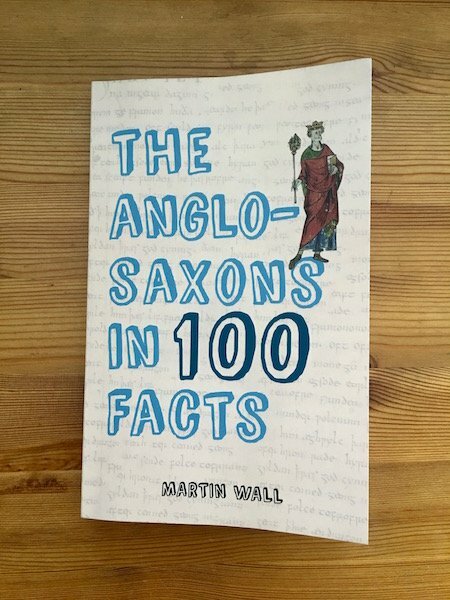 Martin Wall’s latest book, The Anglo-Saxons in 100 Facts brings pre-conquest England to life in a chronological series full of interesting, humorous and gruesome facts about the Anglo Saxons. The book was released on June 15th, and is part of the popular 100 Facts series, and the latest title in Amberley Press’s Anglo Saxon history range. At only 192 pages, I managed to read the entire book on the flight home from London to Toronto. It’s light and compact, making it great for travel. Nottingham was originally founded by an Anglo Saxon leader named Snot and was known as Snottingham! Wall covers some of the lesser known historical figures and events of the period, such as the Pagan king, Penda of Mercia (606-625) and the important, but oft overlooked, Battle of Heavenfield (634 AD) where the decisive Northumbrian victory kept Welsh expansion across the north of England at bay. It also explores questions such as: Why wasn’t England called Anglo-Saxonland? and peppered with catchy and humorous chapters, such as: Celtic Christianity was Betrayed with a Smile, and, Leather Working was a Long, Smelly, Process. It’s a fun way to engage reader interest in this earlier part of the medieval Britain. The only downside of this book is that there were times where it became a little sensationalist. It’s inaccurate to compare Vikings to modern day terrorists – it’s a massive oversimplification. Vikings were not medieval terrorists – the word “terrorist” didn’t exist in this period and can’t be applied to medieval battle tactics. Also, the Anglo Saxons were far from illiterate. Those are sweeping generalizations, considering you had great writers such as Bede (672-735) who wrote the famous Ecclesiastical History of the English People (Penguin Classics) , and leaders such as Alfred the Great (849-899) who was remembered for his educational reforms and as a champion of literature and the English language. Anglo Saxons were also known for their beautiful poetry, such as The Wanderer, The Seafarer, and Dream of the Rood, not to mention the Old English epic, Beowulf. The Anglo Saxons were not just a bunch violent, illiterate brutes, so statements like that need to be re-evaluated. That being said, the book is a great; quick and informative journey through Anglo Saxon England. It is clearly aimed at mainstream audiences. It was written for readers who are interested in learning about Anglo Saxon history but want a less text book/heavy-handed approach. This book fits that bill nicely. It’s Anglo Saxon “lite”, i.e., it’s easy to digest and a fun read, but not for serious historians. Anglo Saxonists won’t find anything they don’t already know between these pages. If you have a budding historian on your hands, want an introduction to the Anglo Saxon period, or want a historical book to take on vacation – this book should be high up on your list. Martin Wall inherited his passionate interesting local history and folklore from his father and has been writing about these subjects for ten years. He lectures historical groups on a variety of subjects and acts as a gallery interpreter in his spare time. His most recent book, ‘The Anglo-Saxon Age: The Birth of England ‘, was published by Amberley in 2015.